If you follow my blog, Twitter feed, or Facebook page, you’ll notice a constant theme: Discover Your True North. Both leaders and corporations have to develop a True North that follows their unique principles. If you try to ‘fake it until you make it,’ you won’t just be unsuccessful; you’ll also be miserable. How can you discover your True North so you can take steps to get where you want to go in life? You have to know what your values are and what’s important to you. To that end, I’ve come up with this list of 30 questions to help you find your True North. Don’t answer them all at once. Take a day to carefully think each one through. Remember, if you don’t know where you’re going, any road will take you there. What one word do you want people to use to describe you? What do you think they’d currently use? If money was no object, how would you spend your time? What would your day look like? Fill in the blank: My life is a quest for _______. What motivates you? Money? Love? Acceptance? If you were to donate everything you have to a cause or charity, which would it be? What is your biggest regret? If you could go back and have a ‘redo,’ what would you change? When was the last time you told a lie? Why? What would have happened if you had told the truth? If you accomplish one thing by the end of the year, what would make the biggest impact on your happiness? What do you think is the meaning of life? Do you live your life accordingly? What would others say is your biggest asset? What would they say is your biggest flaw? Be honest. What did you like to do when you were 10 years old? When was the last time you did that activity? What keeps you awake at night when you should be sleeping? What gets you out of bed in the mornings? List your core values. Use your company’s mission statement to list its core values. Do they match up? What skills do people frequently compliment you on? These may not be what you think you’re best at. If you had the opportunity to get a message across to a large group of people, what would you say? What do you not want others to know about you? Use your answer to find and conquer insecurities. List the five people you interact with most frequently (not necessarily friends). How is each helping you to reach your goals (or not)? If yourself from ten years ago met you today, would he/she be impressed with where you’ve gotten? Why or why not? What bugs you? If it makes you mad, you’re passionate about it! Can you make your anger productive? Fast-forward ten or twenty years. What is the one thing that, if you never pursued, you’d always regret? When was the last time you embarrassed yourself? You have to be vulnerable to find your purpose. Who or what energizes you? What makes you feel depleted? Do you thrive on chaos, or prefer order? Who do you look up to? Who are your mentors, both those you know personally and those who inspire you from afar? Think about your talents, passions, and values. How can you use them to serve and contribute to society? Why do you want to find your purpose? Write the answer down and put it somewhere you can see it. The journey isn’t always easy. What in your life is ‘on hold’? Until you lose weight, until you retire, etc. What are you waiting for? What price would you take to give up on your dreams? What price would you be willing to pay to achieve them? Now that you’ve answered these questions, what is your action plan? What steps will you take today? 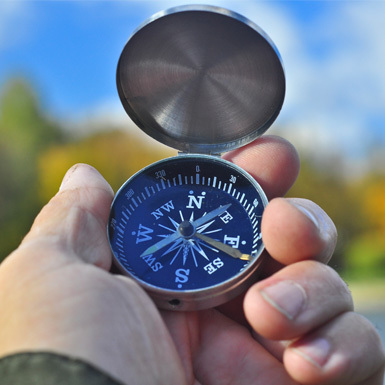 For more insight and exercises to help you find your True North, read Finding Your True North. It offers a full, comprehensive approach to identify and develop your own unique direction in life.